Keerthihan’s Kite is a trilingual children’s book, the story of a small boy and his kite. The text appears in English, Tamil and Sinhala on every page, and the story is brought alive by beautiful hand-painted illustrations by Anura Srinath. The book is accompanied by a DVD of the story being read in all three languages, with animated images of the pictures from the book. 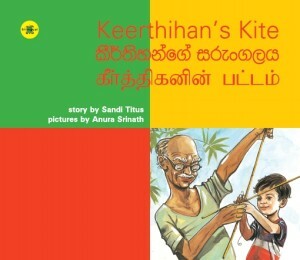 Keerthihan’s Kite is written for small children. But the simple colloquial language and the trilingual text mean that it can also be used as a tool for learning a second or third language – for adults and children alike. For anyone who is not familiar with Sinhala or Tamil script, phonetic transcriptions of the Sinhala and Tamil versions of the story appear at the back of the book. The book was written by Sandi Titus, illustrated by Anura Srinath, designed by Nelun Harasgama, and printed by Gunaratne Offset Ltd. The text was translated into Sinhala by Thilini Ranasinghe and into Tamil by Niruba Pushparaj. Michael Meyler wrote the Foreword and the phonetic transcriptions of the Tamil and Sinhala versions. The DVD was produced by Niruba Pushparaj together with Lasitha Madushanka from Mindfire. Click here to see sample pages from the book. Click here to read the Foreword by Michael Meyler. - in Colombo (price Rs 1500 inc. DVD): contact me if you would like to order a copy direct.